This guide highlights the regulations that apply to flues and chimneys for biomass appliances and points where to go for guidance, when installing a flue or chimney. It is worth reading it in conjunction with the BFCMA guide, General Guidance on the selection and installation of flues and chimneys for wood burning and multi fuel appliances in residential properties. The guide covers both residential and commercial installations. The competencies required for residential and commercial installations are different. Designers and installers of appliances over 50kW should be able to demonstrate relevant competency and follow the regulative requirements of the building regulations and relevant standards like BSEN 15287 and BSEN 13384. Rated up to 50kW installed in a domestic dwelling, an appliance should be installed in accordance with Part J of the Building Regulations (Approved Document J) and with the Town & Country Permitted Developments Act, Order G.
An appliance with a burn rate that is less than 45.4 kg/hr. should be installed in accordance with BSEN 15287 part 1 Annex M.
With a burn rate above 45.4 kg/hr. the requirements of the Clean Air Act should be followed. A screening assessment, produced in accordance with Local Air Quality Technical Guidance should also be carried out. Note. A fuel burn rate of 45.4 kg/hr. is used instead of kW input, because the equivalent kW input for solid fuel can vary significantly depending on the exact type of solid fuel and its moisture content, i.e. for Biomass a 45.4 kg/hr. is equivalent to an input heat range between 100 - 220 kW heat input depending on the type of wood and its moisture content. 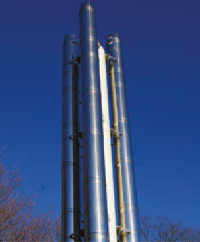 Flues and chimneys are manufactured in a range of materials, stainless steel, clay and concrete (including pumice). Concrete flues cannot be used with wet/ condensing appliances. The CE designations for stainless steel and clay chimneys and flues indicate which ones can be used with condensing appliances. There are two separate categories for condensing and non-condensing in the metal chimney CE designation. When it comes to corrosion it should be noted that a metal chimney with a corrosion classification of V2 under wet conditions is equivalent to D2 and V3 in dry conditions. If the chimney is required to be soot fire and condensate resistant while operating under high pressure advice should be sought from the chimney manufacturer, who will be able to recommend a suitable system. The manufacturer’s guarantee on stainless steel system chimneys is only valid if CE approved components are used throughout the length of the flue. The manufacturer cannot stand over components that have not been tested with the system chimney. There are separate standards for clay liners that can be used for condensing and non-condensing applications. There are a number of variables that should be considered when determining the termination height of a chimney for a biomass appliance. The BFCMA recommends following a 10 point check list. Start with matching the appliance and the flue. (Attention should be paid to the appliance manufacturer’s recommendations. If in doubt contact the chimney manufacturer or distributor). Then look at the chimney height and emissions. Determine the necessary height to create the optimal draught to meet appliance operating requirements. Approved Document J provides clear guidance. Factor in site-specific environmental impacts on the chimney draught. The local terrain (trees, proximity of trees and higher buildings, for example) will have impact on the performance of the chimney. The heat output of the appliance and the total kW/hr rating of the boiler room need to considered, along with the appliance efficiency. The type of fuel to be used, (for example pellets, logs and wood chip), will have an impact on emissions. 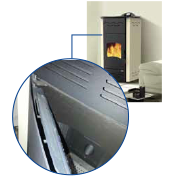 DEFRA Smoke Control Areas require the installation of an exempted appliance. This, however, only covers the appliance. The correct chimney height has still to be calculated. Building regulations requirements must always be referenced. In addition to Approved Document J, the Town & Country Permitted Development Act provides useful guidance for domestic appliances. Approved Document J recommends a flue pressure of 10 Pascal and/or a chimney height of 4.5m to enable the products of combustion to safely escape. The requirements of BSEN15287-2:2008 should be followed for appliances with a kilowatt rating above 50kW. BSEN15287-2:2008 is stricter on termination heights than Approved Document J. When considering the requirements of the Clean Air Act for appliances with a burn rate above 45.4 kg/hr the Biomass Assessment Tool (TG09) should be used. This tool takes into account the post code of the installation. Local Air Quality Management Areas currently cover 70% of the UK. A location is designated a LQMA area if air quality breaches the required limits. In a LQMA area it is the local authority’s responsibility to measure and approve the installation of the appliance. Finally Dispersion Modelling may be required for larger appliances. No one point will, on its own, determine the final required height. Usually more than one will have an actual impact and affect the final determined termination height of the chimney. In a nutshell the process begins and ends with flue sizing. The applicability of some points are dependent on the kW rating of the appliance and the boiler room. The table shows the different regulations used to regulate termination heights and the level of emissions. BSEN 13384-2:2003+A1:2009, and with the approval of the boiler and flue manufacturers. The installation must also be notified to the Local Authority Building Control Officer for approval. Approved Document J, which covers appliances up to 50kW in residential dwellings, does not advocate the use of a flue with more than one boiler. The installation of an appliance over 50kW is outside the scope of Document J and the approved competent persons schemes such as that operated by HETAS. The BFCMA does not recommend twinning of boilers over 50kW in a residential dwelling. Commercial installations generally have planned maintenance contracts with competent chimney specialists who are trained to maintain the installation. Multiple appliances, burning different fuels should not be twinned. Concentric chimneys can overcome the problems with down draught and percussive events. Cowls tend not to be effective on chimneys with a flue diameter below 150mm. The use of a concentric flue is specific to the appliance, so manufacturer’s guidance must always be sought. The positioning of the air in and out vents is important. They must not be too close. Concentric chimneys can only be used when the chimney height is between 4.5 & 17m. Uninsulated systems should only be used internally. Building control must approve a concentric chimney as an alternative installation method. The appliance manufacturer’s instructions should always be followed. Some appliances have a pressure relief mechanism built in to the door, which works both when the door is open and closed. If there is any excessive pressure within the appliance the flap is pushed open. Other appliances make use of third party components. 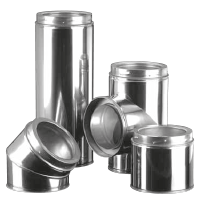 Most flue manufacturers can supply explosion relief components. 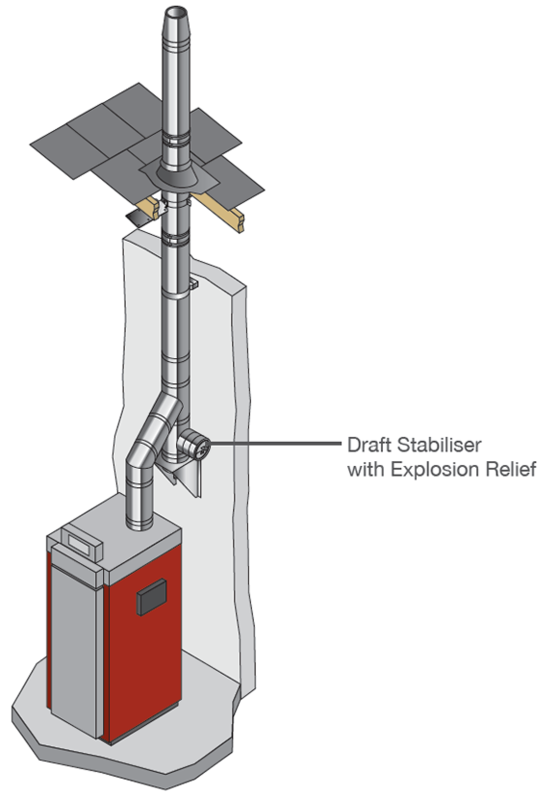 The explosion relief is usually combined with the draught stabiliser. The minimum internal diameter recommended is 150mm. This can be reduced to 125mm if the appliance is DEFRA exempt. In accordance with BSEN 15287-1:2007+A1:2010 the diameter on a DEFRA exempt appliance can be further reduced to 100mm, so long as a drawing is produced and a flue calculation is carried out that verifies the use of a 100mm flue. Sufficient draught test points and draught gauges should be included in the flue design. 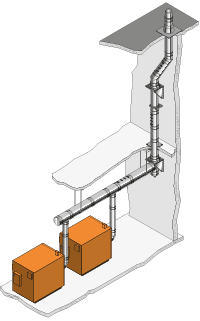 A drain should be horizontal and located at the base of a vertical length. A drain should always be checked to ensure that it is free flowing. The installation of an electrically powered fan can be used to increase the exit velocity of flue gases and overcome the minimum draught requirements in a renovation installation. A fan may be necessary with combination boilers using a single flue. low fire under natural draught, a fan should be used. The correct control equipment needs to be installed to ensure that the fan will work with the pre and post operation of the appliance. Even in the event of fan failure, the products of combustion must still be able to safely evacuate the chimney. Guidance should always be sought from the fan supplier and the heating appliance manufacturer. The appliance manufacturer’s instructions on inspection and cleaning should be followed. The flue should be maintained and cleaned on a regular basis. There must be adequate access points for chimney maintenance. The drawings and photographs are courtesy of H. Docherty, Exodraft, Hepworth Teracotta and Schiedel Rite Vent. 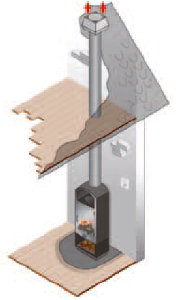 The 10 point check list for chimney height is courtesy of Poujoulat (UK). The drawings in this guide are for illustration purposes only and do not necessarily represent an actual installation. Manufacturer’s installation instructions should always be consulted before installation.